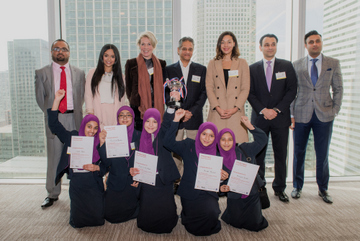 A team of young entrepreneurs from Eden Girls’ School in Waltham Forest has won the London Regional Final of the 2016 Enterprise Challenge competition, a flagship education initiative driven by Mosaic, HRH The Prince of Wales’ mentoring charity. ‘Team S-MART from Eden Girls’ School beat stiff competition from teams from Westminster Academy, Bow School in Tower Hamlets, Park View in Haringey and Skinners’ Academy in Hackney with their idea for a secure online portal allowing pupils to exchange items such as books, electronics, class notes etc. with each other. All finalists had already beaten hundreds of students from other schools across London to reach the final and Team S-MART are the youngest team in the history of the Enterprise Challenge to reach the grand final. The competing teams pitched their ideas in a Dragons Den-style event to a prestigious panel of judges including Jessica Huie, MBE, founder of Colour Blind Cards, Sophie Grenville, Consultant and former Director at WhatIf! Innovation, Ali Ridha Jaffar, Director of Print Express UK, Muhammad Aminuddin, CEO of United Bank and Sadaq Jalal, Chairman of Aviserv Ltd. Team S-MART will now progress to the Enterprise Challenge Grand Final in London on 4th May where they will compete against winning schools from the North West, South East, West Midlands, Yorkshire and Glasgow for the chance to become national champions. The Enterprise Challenge is generously sponsored nationally by Apax Foundation and Qatar Charity UK and supported by Totem Learning. Heathrow Community Fund and Nael Faragy are the principal regional supporters. The London Regional Final had Sayed Bukhari, founder of HPM Developments as guest speaker.